Providing Solutions to Find, Filter, and Visualize Social Media Data in Real Time Echosec is a pioneer in information analytics. The company provides organizations and individuals a new way to for search social media data and other information based on location. Echosec has developed an effective method for seeding investigations and monitoring live incidents in real time. Our system wide focus on team collaboration, communication, and efficiency has launched Echosec into a market leading position as the platform for situational awareness. Ultimately, our goal is to provide an effective location based social media solution to customers who are interested, securing organizational assets, and reducing corporate online exposure. 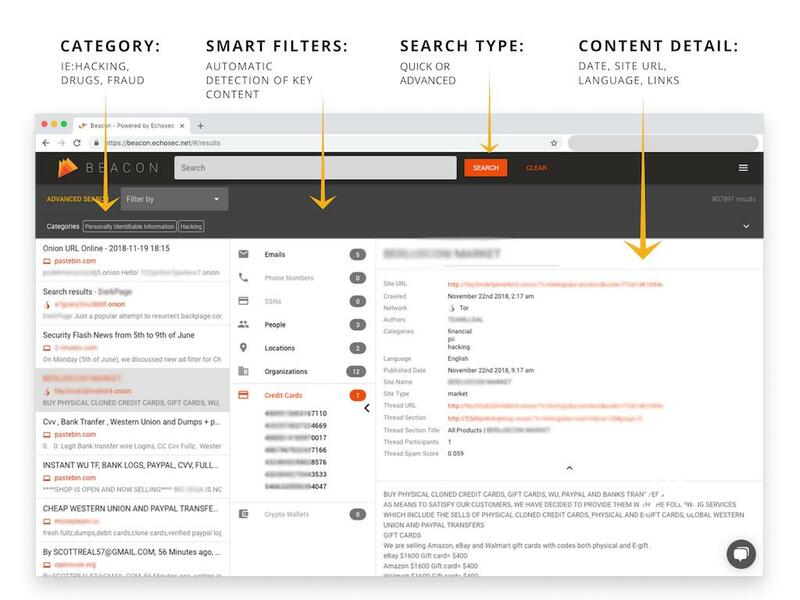 Echosec, an online data aggregation platform, has announced the launch of Beacon, a dark web search tool. Echosec is a location-first social media discovery platform which combines social data with global geofencing technology to collects real-time information. Why Nudge.ai? Reach out to the decision makers at Echosec with a personalized email - let them know that you found their recent news mention interesting. Nudge.ai’s relationship intelligence platform can help you find the right executive to reach out to at Echosec, such as Karl Swannie, CEO, or Stephan Rayner, Head of Research and Development, Software Developer. Then get in touch and start a conversation. Executives can be difficult to reach, but every company has connectors who bring together people and ideas. At Echosec, people like Karl Swannie, and Benjamin Milsom are likely connectors. When Echosec is mentioned in the news, Nudge.ai often sees topics like Social, and Software. If your conversation focuses on these topics, you’ll probably get Echosec’s attention. When Echosec is mentioned in the news, companies such as Dialogtech, and Chatmeter are often also mentioned. These companies can serve as customer examples. Employees who are often in the news are usually open to starting conversations or exploring ideas. Nudge.ai's sales AI saw Karl Swannie from Echosec recently mentioned in the news. Who in your network can introduce you to Echosec? Nudge.ai finds the best pathway to reach contacts at this company.